This is a scenario for MK Rebellion that you can play all by yourself. You compete against an opponent for whom you make the moves according to precise heuristics. You control a 100-point team of warriors from the Black Powder Rebels faction on assignment to infiltrate an enemy base and make an assassination. Your team is comprised of small men that have been specially trained for this kind of job. The opponent (hereafter referred to as "the Enemy") is a 200-point army of warriors from any faction that are dispersed throughout the base, patrolling its corridors. The Enemy's army includes a "Boss", the mightiest among them. When the Boss is attacked he calls all of his minions to his aid. You win if you eliminate the Boss. Your army must consist of warriors from the Black Powder Rebels faction, with the added restriction that you may have no warrior in your army with a point value of more than 30 points. Keep in mind that you will have only one action each turn. After you have formed your army, you must form the Enemy's army. When picking warriors for the Enemy's army, avoid figures that are less useful by themselves because they have abilities such as Defend, Magic Enhancement, etc, and figures that have abilites that are not used in this scenario (see the section HOW THE ENEMY USES SPECIAL ABILITIES). Also avoid mounted figures. Really, you can pick whatever 200 points worth of figures you would like to go up against. For a good challenge, pick figures that you consider to be effective. The battlefield must be a square area of 2.5' x 2.5'. The only terrain that is allowed is blocking terrain. The more blocking terrain you place, the more it will be to your advantage, even though you are Black Powder Rebels. The Enemy's warriors do not know of your presence initially and cannot 'see' you past the blocking terrain. You have one action each turn. The Enemy has two actions each turn. Play according to the standard rules of Mage Knight Rebellion. There is no time limit. Since there is no scoring for points, it will do you little good to capture. The game ends when the Boss has been eliminated, when your entire army has been eliminated, or when you give up. The remainder of this document explains how the Enemy uses its actions each turn. You will often be required to "randomly determine" which warrior the Enemy will give an action to when there are several candidates. To do this, mentally assign numbers to all legal candidates, and then roll dice to select one of them in such a fashion that there is an equal probability that any of the candidates will be selected. For instance, if there are four warriors that the Enemy might move, you could mentally assign the numbers 1-4 to them, and then keep rolling one six-sided die until a number from 1-4 comes up. You will become quite adept at this once you get the hang of it. Also, it helps greatly if you own multi-sided dice, like four-sided, eight-sided, ten-sided, etc. You can cut down on the amount of rolling you must do if you use these. Each warrior that the Enemy controls will always be in one of three states, "Patrolling", "Alerted", or "Retreating". You must remember which state each warrior is in. All Enemy warriors begin the game in the Patrolling state. These warriors are not yet aware of your presence. They are just meandering around the battlefield randomly. Alerted warriors are aware of your presence and are on the offensive. They may be currently engaged in combat with your warriors, or moving in the general direction of the action. Retreating warriors are Demoralized warriors that are moving away from the action. The life of an Enemy warrior can be described thus: Patrolling -> Alerted -> Retreating. Enemy warriors change states according to the following criteria. One or more of your warriors attacks or targets the Patrolling warrior in any way, whether successful or not. At the end of any action one or more of your warriors is in the Patrolling warrior's front arc, and a clear line of fire within 12" can be drawn from the Patrolling warrior to your warrior. At the end of any action the Patrolling warrior is within 8" of any Alerted or Retreating warrior; these warriors raise the alarm that nearby friendly warriors can hear. Also, when the Boss becomes alerted, ALL Patrolling warriors become Alerted. An Alerted warrior becomes a Retreating warrior when it becomes Demoralized. The Enemy will always adhere to the following order of priority in selecting which warriors to give actions to on any particular turn. Alerted warriors that can make a range or close combat attack this turn. If there are more of these than the Enemy has actions to give to, warriors with higher damage value get higher priority. Alerted warriors that are base to base with one or more of your warriors, but cannot make an attack because there are no legal targets within their front arcs. Alerted warriors that are not base to base with your warriors and cannot attack, but could attack after moving once. Alerted warriors that are not near enough to your warriors to attack this turn, nor the following turn. Patrolling warriors and Retreating warriors. Any time that there are more legal candidates to select from than the Enemy has actions left, randomly determine who gets the action. Warriors that still have action tokens are never considered as candidates to give actions to. There is one exception--If an Enemy warrior has a damage value of 3 or greater, and could make a legal attack this turn against a warrior of yours that has a damage value of 3 or greater, consider it as a candidate for giving an action to. This is the only circumstance under which the Enemy will "push" a warrior. The Enemy never passes if it has any actions available. An Alerted warrior that has been selected for action this turn will make a range or close combat attack if possible. If there are more than one of your warriors that it could attack iin one turn, randomly determine which one of your warriors it attacks. An Alerted warrior that cannot attack this turn, but could attack after moving once, will move to the minimum distance necessary to attack. (Such a warrior may need to break away in order to get into a position in which it could attack) If there are more than one of your warriors that it could move into position to attack the next turn, randomly determine which of your warriors it is gunning for. For instance, an Enemy warrior with no range will move base to base with one of your warriors. An Enemy warrior with range will move just close enough so that it could take a legal shot at one of your warriors the following turn (not that it will necessarily do so). Or, if none of your nearby warriors are legal targets because they are base to base with other Enemy warriors, it will also move in base to base. Whenever an Enemy warrior moves base to base with one of your warriors, it will always do so in such a way that it touches none of your other warriors, if possible. Secondly, if there are already any friendly warriors base to base with your warrior, it will move so that it touches your warrior's back arc, if possible. An Alerted warrior that cannot attack this turn nor the following turn will move its speed value in the general direction of your army. If your army is scattered, randomly determine which one of your warriors it moves towards. If friendly warriors or blocking terrain is in its way, it will take the shortest route around them to get to your warrior(s). On a roll of 1 it spins 90 degrees clockwise. On a roll of 2 it spins 180 degrees. On a roll of 3 it spins 270 degrees clockwise (90 degrees counter-clockwise). On a roll of 4 it moves forward one half of its speed value, rounded up, or until its movement is blocked. On a roll of 5 or 6 it moves forward its speed value, or until its movement is blocked. A Retreating warrior will move in the opposite direction of where your army is. If your army is scattered, it will move away from whichever of your warriors it is nearest to. Enemy warriors that have legal targets to attack never attempt to break away. Enemy warriors never make capture attempts. 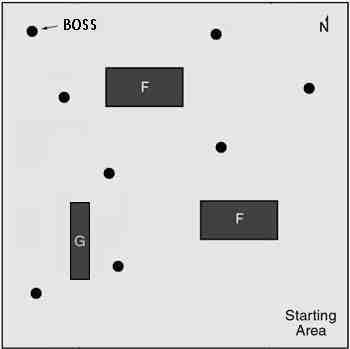 Enemy warriors never attack or move in formations. Whenever an Enemy warriors has an opportunity to "free spin", whether because one of your warriors moved in base to base, or because it failed a break-away attempt, it will spin to face your warrior. If there are more than one of your warriors that it could face, randomly determine which of your warriors it spins towards. It will attempt to include as many of your warriors in its front arc as possible. Secondly, it will avoid exposing its back arc to the front arcs of the rest of your warriors, if possible. The following list contains notes on how the special abilites of Enemy warriors are used. These notes take precedence over the heuristics described up to this point. For simplicity's sake, some abilites are never used at all, primarily abilities that require some intelligence to use. Assume that the Enemy never turns off optional special abilites unless specified below. Charge -- An Alerted warrior with this ability that cannot attack this turn, but could attack next turn with a Charge after moving once, will move into position to do so. If it could not make an attack this turn or the next, it will move twice its speed value in the direction of your army. Quickness -- Essentially, the Enemy gives an action to this warrior every other turn until it is in position to attack. Magic Levitation -- The Enemy never uses this abilty. Bound -- An Alerted warrior with this ability that cannot attack this turn, but could attack next turn with a Bound after moving once, will move into position to do so. If it could not make an attack this turn or the next, it will move twice its speed value in the direction of your army. Nimble -- If an Enemy warrior with this ability is base to base with more than one of your warriors but cannot get all of them in its front arc, randomly determine which of your warriors it will face at the beginning of each of its turns. Ram -- When moving base to base with your warriors, this warrior will touch as many of your warriors in its front arc as possible. Demoralized -- In this scenario, warriors that are normally Demoralized at their Starting Position (Goblin Volunteers) begin the game with their dial clicked one click clockwise. Necromancy -- Whenever this warrior is selected for an action, no matter which state it is in, it will always attempt to use the Necromancy ability if there are any friendly dead warriors. Dead warriors with higher point values have higher priority as targets for raising. Place the raised warrior in front of the Necromancing warrior (12 o'clock position), facing away. Place additional raised warriors clockwise around the Necromancing warrior. A raised warrior has its state reset to Patrolling. Magic Confusion -- The Enemy never uses this ability. Healing -- The Enemy never uses this ability. Weapon Master -- For the sake of determining which warriors are selected to give actions to, consider this warrior to have a damage value of 3. Magic Blast -- This warrior will turn off Magic Blast to make a range combat attack that it otherwise coudn't. Shockwave -- This warrior will turn off Shockwave to make a range combat attack that it otherwise couldn't. Magic Healing -- The Enemy never uses this ability. Venom -- When moving base to base with your warriors or when spinning, this warrior will touch as many of your warriors in its front arc as possible. Sneak Attack -- When moving base to base with your warrior(s) it is more important that this warrior touches your warriors' back arcs than that it avoids touching more than one of your warriors. Sweep -- When moving base to base with your warriors or when spinning, this warrior will touch as many of your warriors in its front arc as possible. Toughness -- This warrior will never "push". Regeneration -- Whenever this warrior is selected for an action, no matter which state it is in, it will always try to Regenerate if possible. Invulnerability -- This warrior will never "push". Magic Retaliation -- This warrior will never "push". An optional rule to make it more challenging to kill the boss: When the Boss' attack value has dropped to 6 or below, treat it as a Retreating warrior for the sake of determining how it moves. "Quick! The Boss is getting away!"